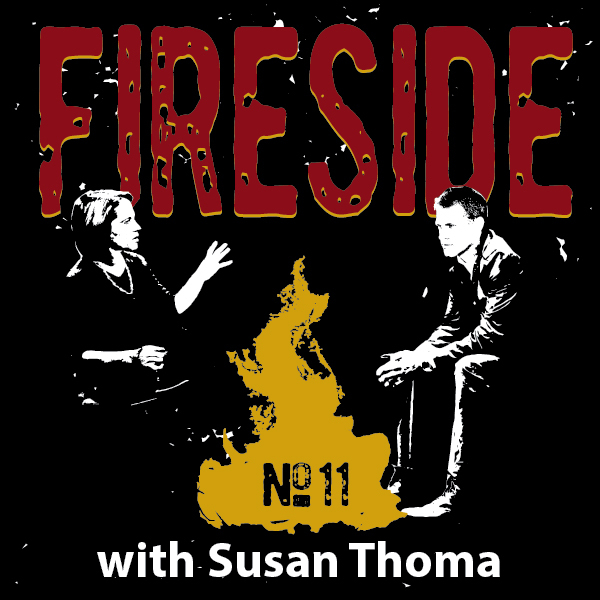 Today's guest is Susan Thoma. Susan is an organizational development consultant and executive coach. Her background includes consulting, communicating, coaching, developing leaders, strategic planning, and event/meeting design and implementation. One of Susan’s passions is integrating music as a metaphor in business. Partnering with symphony orchestra conductors, she has written, produced, and directed interactive educational and motivational forums for leadership teams. In 2012, Susan began caretaking for her beloved husband, John, full-time after his breast cancer returned. She lost John to Heaven earlier this year. Meanwhile, her story continues to unfold. Blake Leath: Susan, thank you so much for joining me today. I know I’ve caught you in a very difficult season. Susan Thoma: I look forward to our visit. Blake: Me, too. Before we begin, I need to clarify something—something that will be helpful to some of our readers, many of whom are mutual acquaintances. Today, you are Susan Thoma, but many will remember you as Susan Engebrecht. Susan: Yes. I’m Susan Thoma, but you’re right, most who know me from my professional career will remember me as Susan Engebrecht. Susan: Correct, no hyphen. I’m Susan Thoma now. Blake: Very good. Understood. Now, I’ve been thinking a lot about our visit, and I have several notes here to myself. I imagine you’ll have much to say about self-management, living on-purpose, navigating trying times, finding meaning in the everyday, and so forth, but I really want to just open myself up to whatever is on your heart. To whatever you’d like to say. Blake: You are interviewee #11, and folks have talked about management, leadership, their life’s journey, public discourse in the United States, politics, technology, philosophy, you name it. So where would you like to start? Susan: I think one of the places to start is after I left Capital One and the corporate world to start my own executive coaching practice. One of the themes that kept tugging at my heart, and which eventually drew me to private practice, was being present. Blake, I found that so many people hunger for others to simply be present with them, and that’s one of the reasons I agreed to do this interview today. Susan: This idea of being present…whether as a coach, or in any interpersonal relationship with family, friends, leaders…really struck a chord with me, and I find it strikes a chord with others, too. With some of the leaders I was coaching at the time, we began to explore what does it mean to listen, to be with someone wholeheartedly, to give someone profound attention, to bear witness, to give them your undivided attention and caring? You know the saying, “We hire employees and human beings show up.” What I found in coaching is that we’re all dealing with a cup of suffering. I’m dealing with one right now with the loss of my beloved husband, and so, being present was an area where I spent some time coaching Executive Vice Presidents to improve…how do you put down the electronic device and be present with employees, really show up and own the impact you’re having on them. Whether we’re employees or family or friends, we’re all dealing with a cup of suffering. Susan: I remember in the 1990s I was part of a workgroup and we lost our dearly beloved boss—who was 37 at the time—and the whole team went through group grief counseling together. Another example would be a senior executive I was coaching at a company. He began with one presenting issue, then broke down crying and I learned about a family member who was struggling with a really difficult diagnosis. Or another time, I began coaching an individual to improve performance issues, only to learn he had recently learned the identity of his biological parents and was wrestling with the whole constellation of thoughts and feelings that introduce themselves into your life and impact on-the-job performance. In all cases, it often begins with being present, and every great leader or manager will come to understand that you can’t be really present in your current role if you’re distracted by what’s going on in your mind, heart, home, or relationships. Blake: There are so many reasons why we fail to be present. Susan: I’ve decided that we must choose to be present, to make it a priority and a commitment, our way of being. People will say, “How do you have time to be present with someone? We don’t have time to be present with everyone!” Sometimes I need to say “no” to protect the boundaries of my time, space, and energy. I’ve eliminated from my vocabulary the phrase, “I’ve been so busy,” or, “I’m too busy.” We use these as an excuse for why we haven’t called people, or haven’t visited them. I think at the end of my life, when I can really look back objectively and examine it for what it was, I will be disappointed in myself if I used the excuse, “I was so busy,” because I’ve come to the conclusion BUSY is an acronym for Being Under Satan’s Yoke, so I’m reminding myself to not use the word “busy” with people as an excuse for why I didn’t do something with them or why I can’t be with them during a certain season. Blake: How do you actualize this in daily practice, pragmatically? 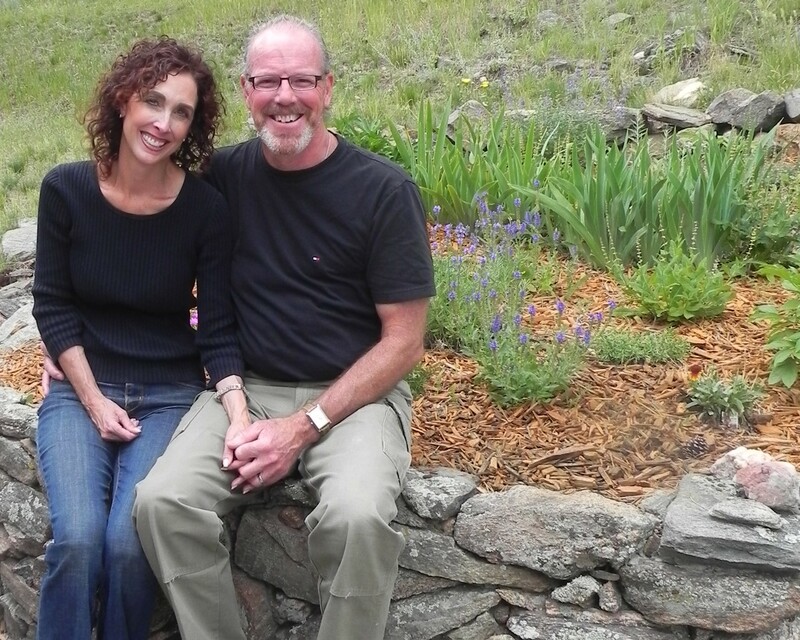 Susan: Five years ago, I was working in my coaching practice and with a start-up organization in Virginia, but behind the scenes my husband’s breast cancer became metastatic. And that translated into an increasing number of appointments, treatment surgeries, and aggressive regimens. 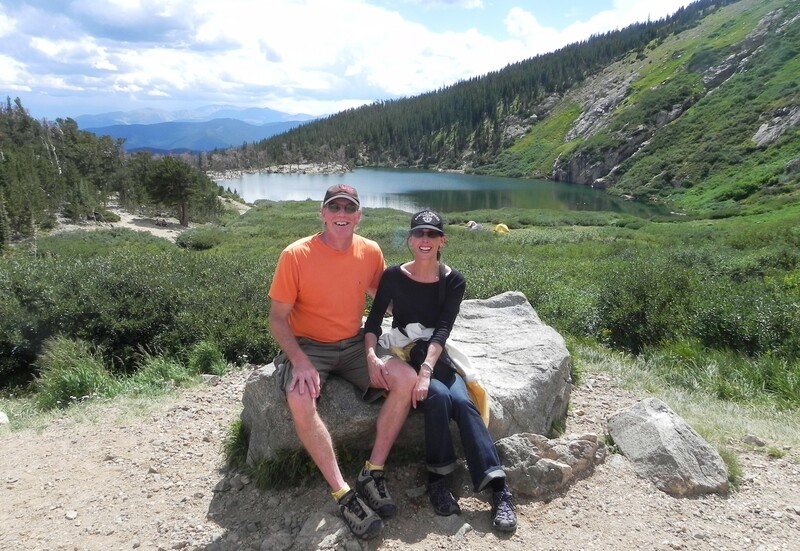 I realized that I could no longer be present with my own clients—and not knowing where the treatments would take us—I made the decision to put my own career on the shelf to be present with my husband. Because you never know how much time you have left together. Blake: Are there behaviors we can embrace to demonstrate being present? Susan: I think one of the most beautiful, demonstrable examples I can share of being present was the way John’s son interacted with him throughout this journey. [Tears] His son is a loving, caring son…a devoted son who called his dad after every chemo infusion to find out how he was feeling, knowing the importance of the conversation and not being hesitant or afraid to venture into the difficult conversations with his dad. To have a spiritual conversation about love, life, and faith. And spending time with him on the phone or in person at the end of very, very difficult days. Another example would be our dentist. John had to go to the dentist two days before a major surgery, because he knew he wouldn’t have the strength or capacity to see the dentist afterward. So there we are, with the dentist—who asks John how he’s doing. In that moment, the dentist asks, “Can I pray with you?” Right in front of his staff. Right then and there, with John in the dentist’s chair, we all prayed together, and that had a huge impact on John’s well-being and state of mind as he prepared for surgery two days later. Or it’s a couple who brings dinner to you at your home after you’ve returned from a chemo infusion and you’re exhausted and spent and your husband’s nauseous. And so, yeah, you break bread with them, spend some time eating what you can, and then they pray with you in your living room. Blake: What do all three have in common? Susan: Listening. Treating someone with dignity and respect, and carrying the conviction of understanding and compassion. Remembering. Following up. Checking in with them when you say you’re going to check in with them. Praying with them. Coming alongside them. Blake: I have to believe that prayer has been a huge part of your journey, because otherwise, much of it is out of your control. Susan: I’m learning how to pray, and I’m learning the real purpose of prayer. God had the power to heal John, but in His wisdom He chose not to. And so many prayed for John’s healing, but it didn’t come on this earth, and sometimes it’s not the right time. God says not now. But we have to remember that God is always God, always good, always our Father. He has infinite, limitless love for us, and He has a purpose for everything and everyone. I’ve been listening to Tim Keller, a pastor and author out of New York, and he reminds us that the real purpose of prayer is not to get God to give you something; the real purpose of prayer is to really get God. To get your heart in the right orbit, centered on Him. The purpose of prayer is not to merely affirm that God is central, but making Him central in your thinking, in your feelings, and in your planning as you think about life. Knowing that He understands all our needs, long before we do. I’ve been reflecting a lot on The Lord’s Prayer, a model prayer, the third line being, “Thy will be done,” and the fourth being, “Give us this day our daily bread.” Thy will be done comes before giving us our daily bread, so God is reminding us that first we’ve got to accept. We’ve got to accept His loving purpose in everything—accept first—then bring our needs to Him. Our God is a God of order, and even here there is order. We are first to obey and honor, otherwise we rip up the fabric of prayer. So then I wonder, what does it look like for Thy will to be done? This line of questioning shifts my thinking, gives me spiritual insight, and an overwhelming sense of grandeur and glory. God is on His throne in Heaven, all is as it should be; I am transformed and upward looking, He gives me vision and wisdom to see things as He wishes I would see them. We all have our cup of suffering, so ultimately the question becomes, how are you handling your suffering? Susan: Suffering is going to change you; it will make you bitter or it will make you better, so as I go through this grieving process, my quest is to see God’s loving purpose in everything…and while it’s not easy, and it’s one day at a time, He renews my hope, He takes death’s sting, He gives me deep thoughts about suffering, and reminds me every day to think of life in the context of eternity. I think that’s what is happening with me, and it affects how I think about love, and sacrifice, and the long term, and fear…and what not to fear, and how I want to make a positive difference in others’ lives. [Tears] I’m sorry, Blake, I didn’t expect to cry in this interview. Blake: Well, I didn’t either, but I don’t mind, Susan. Loss is part of life, and I’m moved by your perspective and take great comfort in it. I’m reminded of the losses in our own family, and can’t help but think that—whether five years, eighteen months, or overnight—the sense of loss can sneak up on you, or it can hit you like a freight train. Susan: Yeah, a psychological Mack Truck. Blake: After people pass, sometimes prayers are all we have, and they’re a process, and they evolve. Sometimes we wake up, just missing someone so deeply it hurts, and there’s no substitute for that person, no surrogate, he or she is simply gone, but we can take our loss to the Lord, and He brings us through a season of grief to a season of peace. When we’re feeling empty, or tired, or hopeless, or broken, prayer can be particularly restorative and renewing. And like I’ve described before, business is personal. Sometimes the greatest gift we can bring someone is our presence. To simply be present with them in their season of grieving. Blake: I think grief is like an ocean, ebbing and flowing, but always there. Sometimes we can predict high tide, whether it’s a trigger like a birthday or anniversary, and other times it swallows us whole in an instant, and we’re in over our head because of a scent, or someone who reminds us of someone else. Blake: It’s a good reminder that sometimes we are triggers, and that as the people in charge of, say, an organizational change, we often tout the benefits or value of that change, but for employees, all they may perceive is loss…the loss of stability, the loss of control over their own destiny. They are widowed, if you will, unmoored. I think grief—and good grief…how to grieve well—is something every survivor or person who outlives another will wrestle with in the course of his or her life. Can you talk a bit more about your own grief journey? I know coping is not the right word, but how are you managing through your grief, what has it taught you, and what have you learned about grief itself? Susan: Well, I think there are the things you can anticipate and plan for, triggers, as you said, like John’s birthday, and our wedding anniversary, both of which occurred within the month immediately after his passing. I knew those dates would be difficult, so I just planned my schedule accordingly, because I knew there would be a lot of emotions to deal with during that time. Susan: And then, for a stretch, maybe you’re doing pretty good, and out of the blue someone calls just to catch up, and they haven’t heard, and whammo, you’re explaining what’s happened and reliving it. Blake: I’m sorry; that’s obviously what I did to you, too. Susan: No worries. A larger point would be that grief brings an earthquake to one’s identity. I’m no longer John’s wife; I’m no longer a caretaker, so who am I? What do I have? I hit pause on my career, so that’s one reality that identified who I was…then. I’m finding, though, that as a spiritual person, a faith-filled person, that God is present in all this, every day, and every day He reminds me that I am not alone, that He is with me—whether I’m alone with Him, or spending time on the farm, or feeding the cows or turkeys or deer, or I’m trying to replace batteries in the thermostats in the house, or mending fences, or asking for help… [voice trails off]. I’ve been able to do most of these things, many things my husband did—and he enjoyed doing them for me—but I’m learning to do them myself now, and I am reminded of John in doing them…so it’s God’s grace all over again, and little win/wins for me. All these little steps are reasons to celebrate; they are tiny victories; they are little blessings along the way. It’s the same in organizational change, or when a company has to downsize. You learn to let go of the loss, to find reasons for celebration of new beginnings along the way—little victories—of the transition. It’s about seeing and celebrating new beginnings, celebrating a new team that’s formed, a new corporate identity, transitioning from one stage into the next. You don’t forget; rather, you simply understand there is a new normal. Susan: And these new beginnings are important, no matter how small they may seem in the moment. Blake: In the same way prayer can be about the process of prayer, I also believe that grief may not be about getting to the other side. I don’t think any of us necessarily forgets about the past, or loses the feelings; it may be more a matter of coming to terms with them, of finding a way to incorporate them into our new self, or learning to let go yet remain one with them. Susan: Yes, yes, yes. I mean, I think we are always going through transitions, and losses—big and small—and new seasons come and go. It’s not necessarily time…sometimes it’s the impact, and the effects, and the emotions you’re going through, and how you learn to live through and after them, and then again when they’re triggered and visit you in the night. Blake: But you can’t go around loss, right? I mean, eventually, you have to tackle it head on, otherwise you can never move through it. Susan: That’s right; you’ve got to go through it, and sometimes that means just feeling really deeply…and cutting yourself some slack, and allowing yourself to admit there’s a monumental loss here and to just park in it for a while. Blake: And sometimes, employees, for example, have a hard time identifying or putting their finger on why they are resistant to an organizational change. They are curt, or angry, or emotional, and something’s amiss, but they can’t quite identify it, or articulate it, or express it succinctly or clearly. They just feel displaced, or confused, or bitter, or regretful, or scared, or whatever. I think as agents of change, managers have to be sensitive to these emotions, versus demonizing someone because, say, she’s resistant to change and therefore needs to be changed out. Susan: And sometimes you’re called in to simply help and clarify and crystalize what it is—and name it, acknowledge it. And sometimes it just doesn’t matter; it’s more a matter of being present with people and helping them discover for themselves—in due time—why they are so emotional or struggling with the change at hand. Blake: I think sometimes we kid ourselves and pretend that a stiff upper lip will buoy us until we can swim to the other side, but maybe there is no other side, or maybe we have to hit rock bottom before we can spring back to the surface again. Susan: In hindsight, I think I began grieving John’s passing even in the caretaking process. Blake: Oh, I’m sure that’s the case. We’re intuitive beings, and our hearts are usually faster than our minds; I think it’s often the case that we know something in our bones before we can give language to it. I’d like to ask a difficult question, then, if I may? Blake: Was there a point…and I know this will be difficult to think through…but was there a point at which your praying changed? I know that for many of us, we pray for healing, for miracles, for God to show Himself by flexing some muscle…but sometimes…somewhere along the way, we begin to pray instead for peace, and for letting go. Twice in my life, I’ve found myself praying for the strengthening of my testimony rather than the beating of odds. Let others’ faith in You not be diminished. In fact, I recently heard a widower say, “Don’t waste your cancer,” knowing that a gracious, faith-based death is a powerful testimony. Susan: I think certain people were praying all the time that John would be miraculously healed, but when I started to see that his body wasn’t able to handle the chemotherapy…that we were then very near to the end. I called the oncologist and asked, “Do I take him to the emergency room?” because I knew it would be very difficult getting him to his next appointment, and his oncologist said, “Susan, it’s when you say those words that I know it’s time for hospice.” The doctor told me about how much time he thought John had left. And that was the Mack Truck in my face. I think when you talk about hospice you come to terms with reality, and understand that healing on this earth is not going to happen. So then, that’s when the prayer changed to, “God, keep me a strong witness through this,” and yes, you’re exactly right, Blake, you begin to see it as a testimony. Blake: Let’s talk a bit about the transition after loss, about the season that comes right on the heels of death. Not to compare the grief, but to think of corporate or organizational comparisons, I think back to 2008, 2009, 2010, 2011, when the economy was tumultuous, when my family and our business—along with hundreds of thousands or millions more went through tumultuous change—and people lost life savings or were otherwise upended for three to five years, and many will never recover. I have many friends who say they lost a decade, were wiped out, have had four to six jobs since then, are still making 20-40% less than they were at their peak, and it’s been tumult after tumult. What word of hope or encouragement do we offer to the unmoored? Susan: If you’re a believer, you’re not unmoored, and though you may feel abandoned, you’re never abandoned. I, too, know many people who lost much in that very season you’re describing, up to and including their identity, and to those people I say, “Roll your sleeves up and get engaged.” Find what you’re passionate about, what you care about. Find a person, place, or cause toward which you can make a contribution; volunteer, find meaning, make a difference with others who are less fortunate than yourself. One person I coached, years ago, lost his job and began doing philanthropic work with kids. He did it part-time and began to discover himself again—and his soul—and was reminded he was worthy, he was valuable, he had mad skills, and he could pour them into causes and make a significant difference doing so. I think that’s important. For me, I even find that it’s been doing more manual labor around the farm, and I know a lot of people that get into activities…physical activities…whether cycling, running, returning to the gym…and they learn to feel good about themselves again. Blake: A little sweat can be a wondrous balm. Susan: And staying connected to their families, their spouse, their kids, the people in their life whom they love and value and cherish, and finding ways to engage with them in meaningful ways, or spending time with them in ways they haven’t before, or in the past, or in a very long time. I think such endeavors clarify one’s values and help us remember who we are, or were, or are meant to be…were designed and made to be. We shouldn’t settle for less fun! I think remembering our values during these seasons is essential. Staying connected, being connected, not allowing ourselves to get too isolated. Community. Community is really important during seasons of loss or personal doubt. And yet, quiet reflection and solace is meaningful, too. Striking a healthy balance is key. Blake: The boogieman comes in the dark. Susan: I’ve got a friend working at Home Depot, in large part because it keeps her connected, engaged, near to organizational development, to Human Resources, benefits, that whole world. She’ll make a go of something soon, and it’ll be great, absolutely great. Life is short, and God puts it in our hearts to have passion for something, a reason for being, something important to do. I think it’s important to listen to this voice, to find our passion, to go and do and be. Blake: I suppose it’s too early, but have you begun thinking about what your next chapter might look like? How will you channel all you’ve learned and are learning? Susan: I’ve thought about it, and I don’t really know! I’m going to let it unfold, but I know I want to continue to do something I love to do, something that gives me meaning. I’m going to take it a day at a time, but yes, it will come to me—has not yet—and that’s fine. I’m still in the wilderness experience. Blake: You’ve certainly earned the time to ponder. Susan: A lot of people say give things a year, and I don’t know if that’s true for me, but we’ll see. Sometimes in the quiet moments, and by being still, we can know. God will put voices, people, experiences in our midst, so I just need to honor and recognize these when they show up. I think that’s important. Susan: And in my relationship with my husband, and our memories of him, and wherever he is in Heaven, she’s right. It can make a big difference to know their legacy lives on, and to embrace the impact they had on you. John’s spirit resides in my heart. Blake: Okay, to summarize, you’ve talked about being present, about prayer, about identity, about transition, about finding meaning in loss. I feel pretty convicted now, having remembered Scott’s interview, so tell me about John. Susan: Beautiful question! He was a geologist, and he was also a woodworker. He loved making furniture, made a lot of beautiful furniture. And that’s what he wanted to do more of. And he just loved the outdoors—hunting, boating, hiking, golfing, being in God’s presence through nature. He enjoyed a lot of meditative work, and work with his hands. He wanted to do more woodworking. And he had a real heart for those hurting, for those in need. Some part of what I’m processing is trying to figure out how to continue his passion for helping others. Blake: Did he pass with any regrets, or did he feel he’d spent his time wisely? Was there more he wanted to do? You know, one of the things I’m doing lately is reading a lot of books on Heaven. Knowing there will be a reunion in Heaven, that there is reason for hope, for all of us. Business is tough, life is tough, working with people is a blessing, but it’s not always a bed of roses. I think, specifically, about those sweet, courageous children who show up every day to the cancer ward. Day after day, appointment after appointment, for weeks, months, some for years. How do you find hope in a children’s cancer ward? I think it comes back to faith, to optimism. Blake: And love! And, of course, I’m reminded of my interview with Gary Moreau, who in fact talked about something similar. Children, arm in arm, in this thing together, in the hospital. I think community, and connection, are key. Viktor Frankl wrote about those very things: connection and meaning, logos, logotherapy, finding a purpose and greater good that transcends the current loss and devastation. Susan, how did you remain hopeful with John, because I know that caretaking role can be devastating, and we’ve seen it take its toll on so many. Susan: I think one of the things is never underestimate the impact of a single moment with anyone. The tiniest moments can renew someone’s spirit or break their soul, so whether you’re sitting in the waiting room with other cancer patients, or listening to the oncology nurse or doctor, just be present, know that they are in the midst of their own difficult days—seeing this day after day—and be a powerful witness, a living testimony. Remember, we all have that cup of suffering, but being present, being real…John had the best way about him, and to see how he engaged with those oncology nurses, the staff, they loved him dearly, and he had a way of making them laugh, of lifting their spirits in the middle of all of it. We’re either impacted, or impacting, or both; there’s always something going on in a person’s life, and finding ways to be a blessing to them…it’s an opportunity we’re given each single day. Blake: Thy will be done, then give us our daily bread. Blake: In July, a couple of us were on a flight from D.C. to DFW and sat right behind Mike Love [The Beach Boys]. We were rain-delayed for nearly three hours on the tarmac, and I kept thinking to myself, “If this were Southwest Airlines, I bet they’d cajole Mike into singing us a song, and it’d be a lifelong memory for everyone on board.” It coulda been so cool! It would have taken him 5 minutes, and he could have uplifted the entire plane, making a lousy experience a once-in-a-lifetime experience. I can think of a hundred reasons why he didn’t, and I respect that, but anyway, I just thought it woulda been cool. Susan: I do look back over my life and wonder what I would do differently, what I can still do. I don’t want to feel regret, so I’m trying to honor what I learned through caretaking with John, and be in-tune to what those moments might be. Blake: I’m a big believer in perspective, and clearly you’ve got this amazing perspective now. Susan: Absolutely. Kingdom impact, eternity, love, sacrifice, long-suffering. And I’ve coached so many young women over the years who have had so many debilitating insecurities, fears, unjustified ways of thinking about themselves. They worried they were falling short, they worried about pleasing others, they worried about money, about their own self-worth, you name it. Blake: And what would you say to them now? Susan: You’re exemplary. You’re listening to the world, and you need to be listening to God. Find out what He’s calling you to do, and go do that, but also know that with God—you’re always enough. When you’re in the wilderness, just humble yourself; listen to Him. He’s got something to speak to you, something planned for you; hear His voice. Blake: It sounds like you’ve done a fine job of pausing, listening, tuning in. I can’t help but think how difficult that’s become in today’s world. Everywhere I go, everyone is head-down, their eyes fixed to the screen. I don’t know if this was your experience, but growing up there were times we just got flat-out bored, so we’d make something, or hop on our bikes in bathing suits and find somewhere to go and swim. We’d make a plan, and get outside. Today, I just see so much isolation, silence, distraction. I think we’re all struggling with what sort of people are we making? Blake: I don’t think our culture values stillness anymore, despite the fact that many of us are so sedentary! I think being still—and thinking, or staring out the window, or simply pausing and being quiet and appreciating—are dying values in our society. Susan: Oh, Blake! That is why I love the photo on your blog—you are reflecting and staring out the window of an airplane—I know how intentional that photo is for you! And I’d still rather write a handwritten note and put it in snail mail than send a text or an email. Sometimes I think I should have been born back around the turn of the century. Blake: Oh, man, that reminds me…yes! 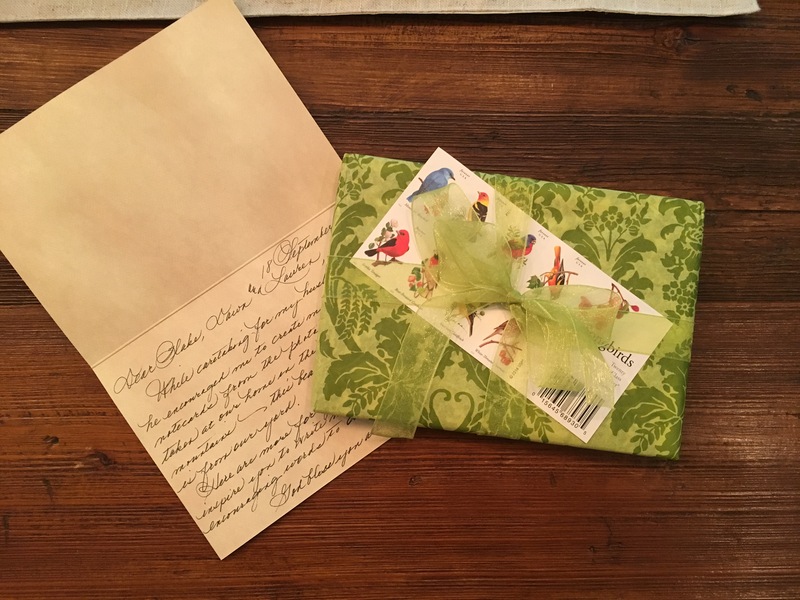 I’ve gotten some of the most amazing cards from you over the years! You do this gorgeous calligraphy. Blake: I’ve sent a lot of handwritten notes, actually used ink! Wrote stuff down, licked it, put a stamp on there, and placed it in the mailbox. It’s a big deal to folks; I find them in people’s offices all the time, years later, pinned to a board or propped in a window sill with dust or spider webs on ‘em! Susan: I love that. They’ve kept them. Susan: He was important to them. They respected him. He was worth more than a phone call. Blake: Exactly. It was really humbling, and meant the world to him. Susan: Well, that’s the power of being present! Susan: And to do that, Blake, speaks volumes about Toyota’s culture, right? Blake: Right, they want to build relationships. Anyone who flies halfway around the world, invests 24-36 hours in transit, goes through the hassle of customs, just to tell you things are going well and we’ll be in touch, is someone who obviously really cares about people. Susan: Their actions spoke louder than their words. Blake: 'Cause they coulda just emailed their words. Blake: Toyota has opened its North American headquarters just up the road here, and it’s spectacular. Half a mile wide, nothing but glass, and they used the glassmaker that makes their windshields. I think it’s a physical embodiment of their values, their culture. It’s a literal manifestation of what’s important, and how they want people to interact. I can’t help but think of Apple Park, which is unreal. Susan: The spaces we design say a lot about what we value, and what we want from our employees. I’m sure it will be spectacular. Blake: Susan, you’ve been a trooper. We’re at the end of our time together, and I just can’t thank you enough. I know this was difficult, but it meant a lot to me to hear how you’re doing, and to learn more about John, his legacy, and your journey through this. Thank you for being present with me. Susan: Thank you for being present with me. Blake: I’m finding the lines between management, leadership, corporate culture, life itself…are permeable. Blake: Well, I think your words will be an encouragement to many, and I think we could all use some extra doses of encouragement these days. Susan: I’m glad you’re being intentional about positivity. You guys have a lot to offer people, and I hope it’s infectious. That they want what you have. Blake: God bless you, Susan. Susan: You too, Blake; keep at it.